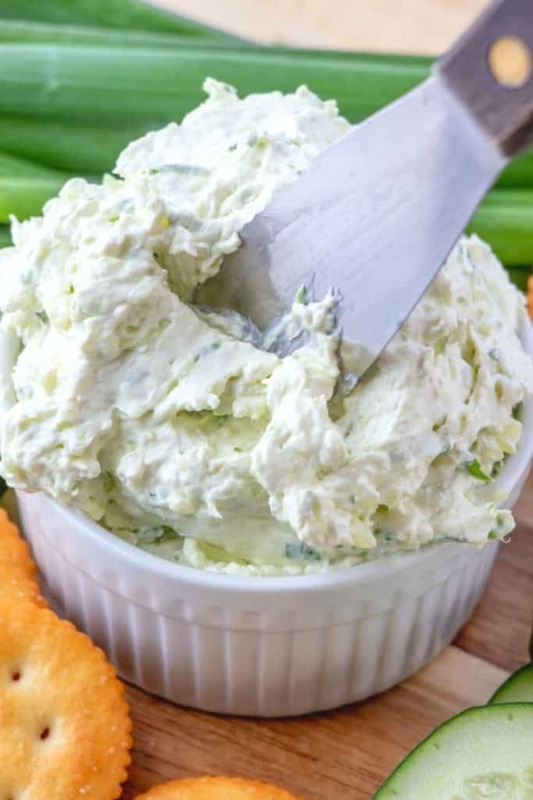 Cucumber Cream Cheese Spread is perfect for bagels or crackers. 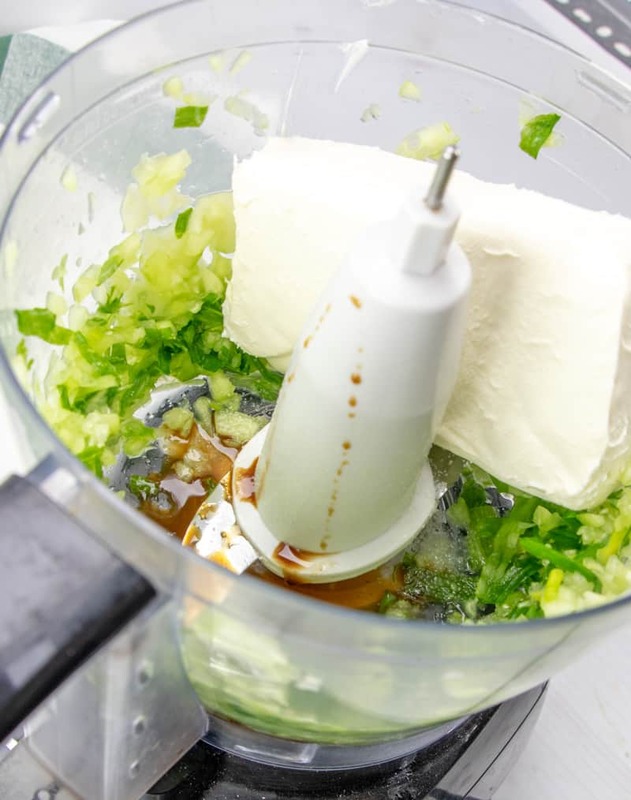 Fresh cucumbers, green onions, Worcestershire sauce and cream cheese. 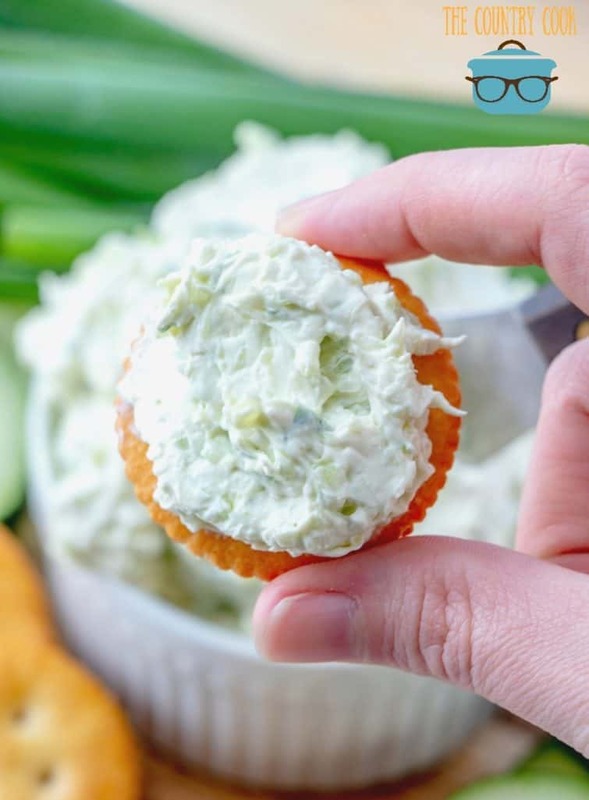 If you are a fan of bagels and cream cheese or if you like to snack on crackers with some creamy goodness smeared on top then you will really enjoy this spread. My friend Patti calls it “Cucumber Crack.” Ha! IS IT LOW CARB OR KETO-FRIENDLY? I make this quite often for myself and my girlfriends. It is great to snack on or you can make a meal with it by spreading it on a lightly toasted bagel and having it for lunch. It’s also a refreshing appetizer. And yes, it is low carb! 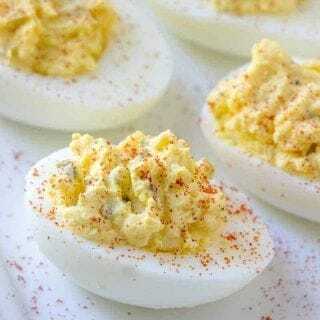 My low carb friends, they enjoy eating it on low carb tortillas or even on zucchini slices. 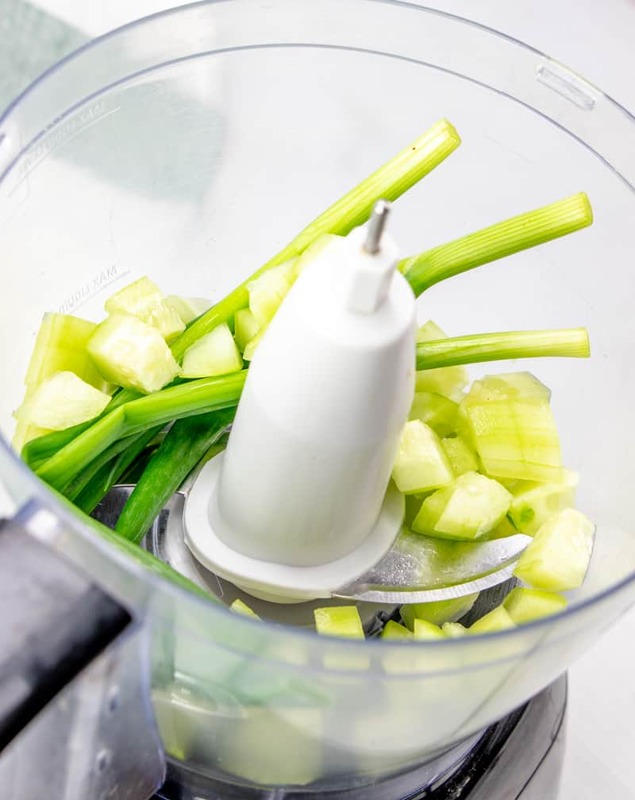 To make in the food processor: trim away roots from base of green onion, place in food processor. 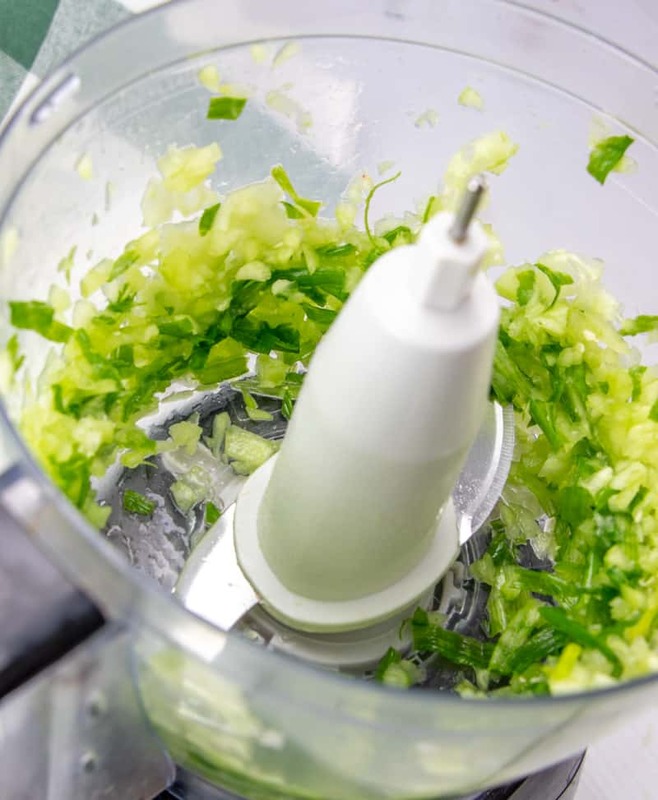 Add cucumber to food processor bowl. Cover and process until coarsely chopped. Add cream cheese, Worcestershire sauce and salt. Cover and process until smooth. Transfer to a medium bowl. Cover and refrigerate overnight for flavors to blend. Serve on a toasted bagel or with crackers. Cook’s Notes: You can use as little or as much cucumber you like in this. 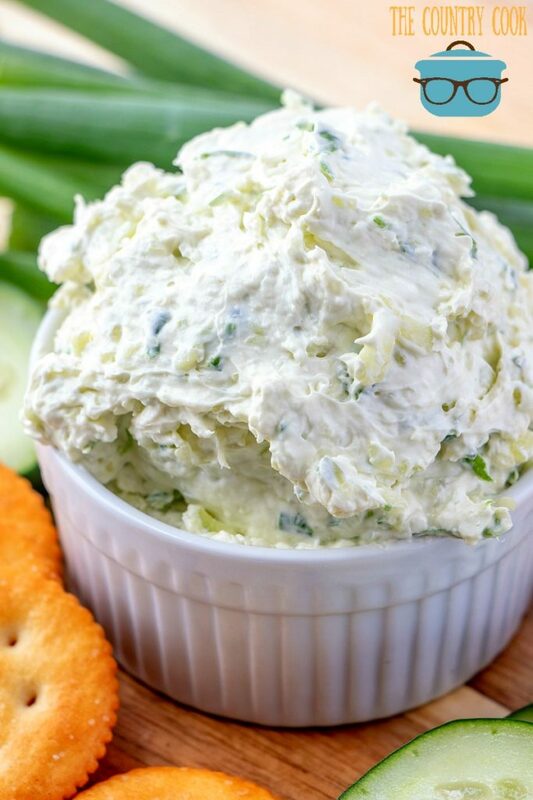 Cucumber Cream Cheese Spread is perfect for bagels or crackers. 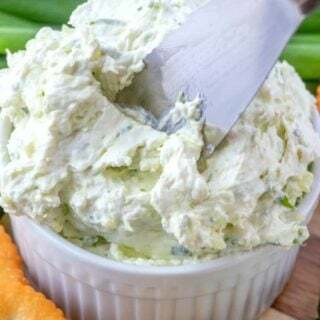 Fresh cucumbers, green onions, Worcestershire sauce and cream cheese. Trim away roots from base of green onion, place in food processor. Add cucumber to food processor bowl. Add cream cheese, Worcestershire sauce and salt. Cover and process until smooth. Transfer to a medium bowl. Cover and refrigerate overnight for flavors to blend. Please don’t skip this step and try to eat it right away - trust me, it makes a big difference in flavor when you let it hang out overnight. Finely chop the cucumber and the green onions. 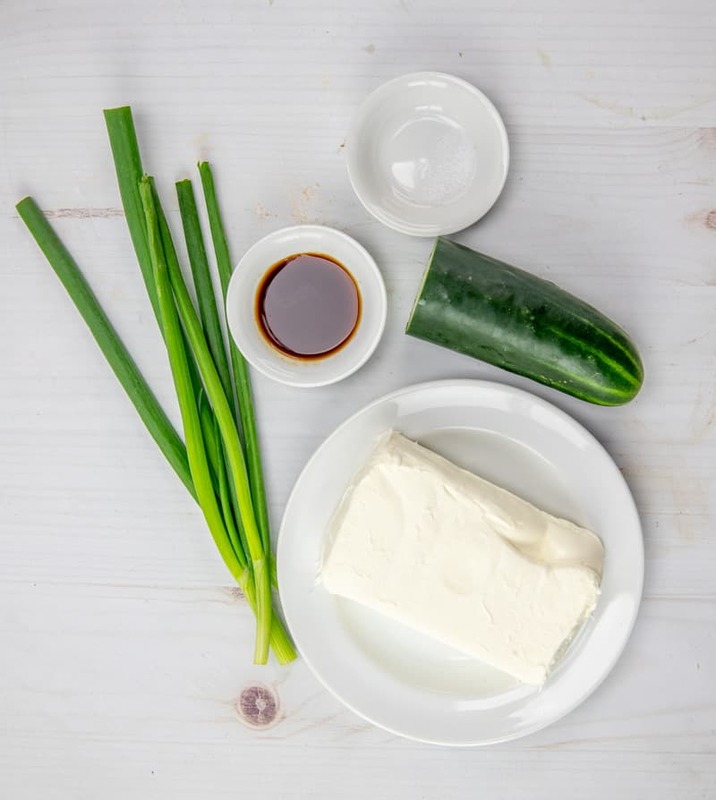 In a medium bowl combine cucumber, green onions, cream cheese, Worcestershire sauce and salt. Beat with an electric mixer until smooth. Cover and refrigerate overnight for flavors to blend. Use as little or as much cucumber that you like. Make it to your taste! Serve on a toasted bagel or crackers. Want more cucumber recipes? Try these! Here in the Deep South , we make cucumber sandwiches for all our showers and ladies get togethers. I personally like to make up the base you have posted and then slice my peeled cucumbers thin and place on paper towels, salt them and let them sit for a few minutes. Then blot them with another paper towel and place them on top of the wonderful base mixture and top with dill weed or parsley flakes. I cut my bread to fit the size of the cucumber. Sprinkle with bacon bits and dill weed. Enjoy your blog very much. We just picked our first cucumbers this week!!! YEA!!! I had a cucumber and spring onion sandwich with mayo, salt and pepper last night. It was so good!! Mother use to make little finger sandwiches for parties with something similar. She cut them in rounds and placed a thin slice of cucumber on it. So good! Thanks…Pinning it!! 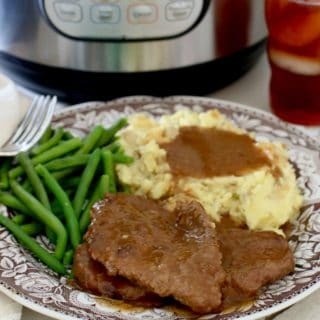 Hi Brandie, Love these recipes with cucumber! My Daughter loves them! 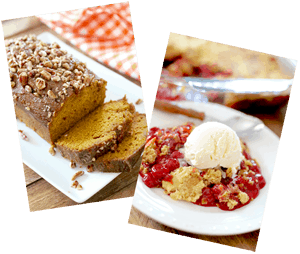 Going to visit her in Tennessee in a few days and I am definitely going to try these recipes! Thanks soooo much for posting them! 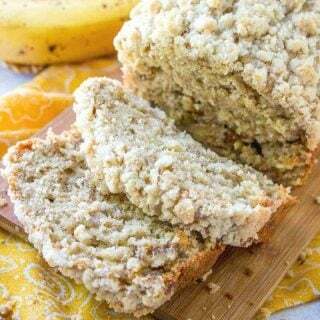 Love all of the recipes that you send to my e-mail!!! 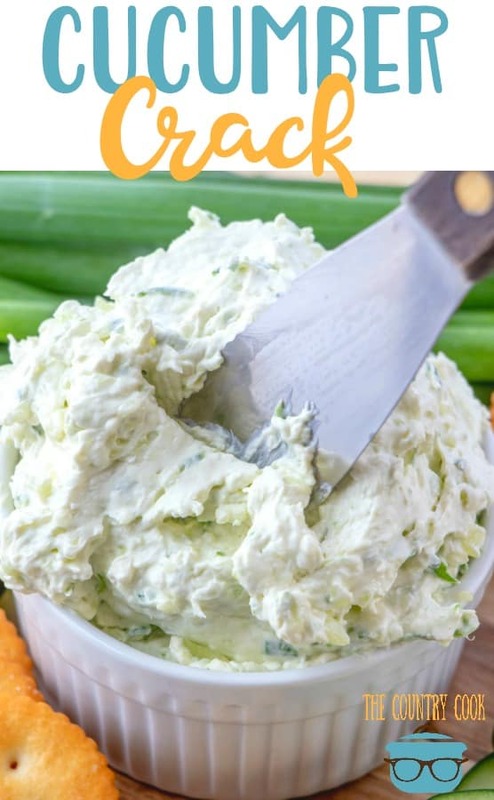 I am not a cuke lover in the least, but this recipe is a favorite! I love the ease of the recipe…the wonderful flavor combo…and that this lasts several days (only if I forget it's in the fridge). 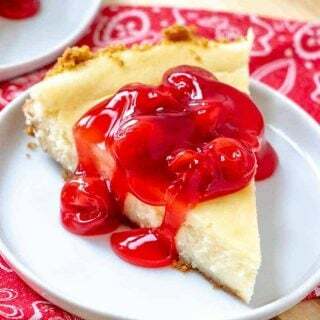 Thanks for sharing such great recipes!!! As anonymous from Ky. said, we grate the onions and cucumbers before adding them to the cream cheese. Then add paprika and a little green food coloring to make our Benedictine spread. It was developed in the 1920s, I think by a Miss Jenny Benedict who served it in her tea room in Louisville, Ky.
Could you use this on mini croissants for a different twist? In Kentucky we call that spread Benedictine! Not sure where the name came from but its a staple around here. Some people put green food coloring in it but I don’t. Best sandwich ever is benedictine, bacon and alfalfa sprouts on whole wheat. Yum! 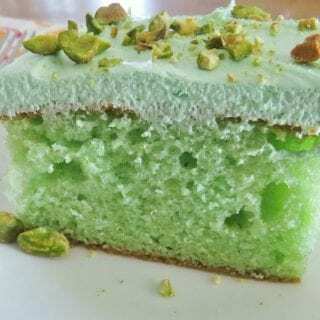 WOW!, GREEN food coloring! St. Patrick’s Day here I come! LOL!!! Should you remove the seeds from the cucumbers? This recipe sounds yummy, and I will try it. Spring is in the air down here in Texas and this sounds just right for the season. I love shepherds salad with my falafels and I am tempted to try this on my pitas, too! It is springtime here in Texas and this sounds like just the ticket for the season! I love Shepherd’s salad on my falafels and this would rock a pita and falafel sandwich. I see it makes 4 servings. How much is in a serving? This is so delicious. The green onion really adds something that my other cream cheese spreads needed. Thank you so much! That’s awesome Billy – yay!! This looks so good! 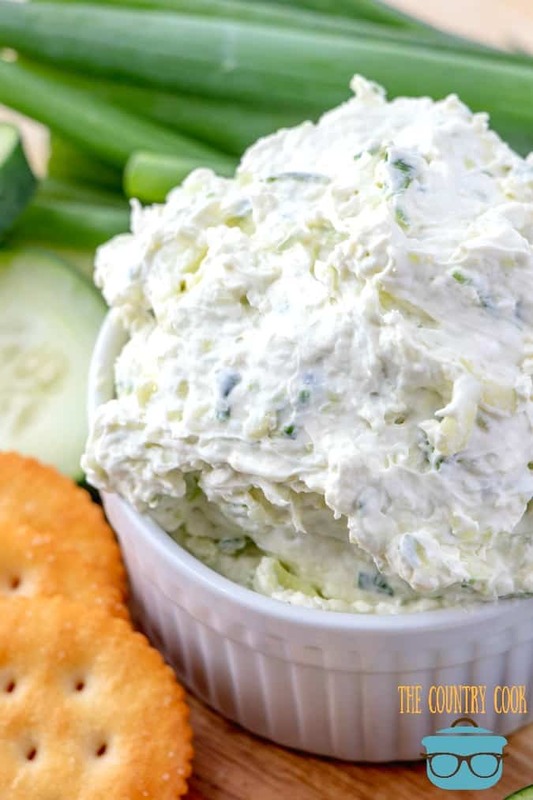 What a refreshing appetizer to bring with a party! I was disappointed in the texture of this. The photo looks like it would be spreadable but it turned out more like a dip. The flavor was good. Hi Mary! Hmmm…it shouldn’t have been like a dip. It really should’ve been more like a spread. I am thinking perhaps your cucumber released a lot of liquid. Some cucumbers are just super juicy and hold a lot of water. There’s a couple of things you can to do to prevent it in the future. You can dice your cucumber and then sprinkle a little bit of salt on them and place in a colander in your sink. Give it about an hour or two and the salt will help the cucumber to release the liquid. Then rinse and place on a paper towel and dry them off. Then proceed with the recipe. Hope that helps! Have made this forever…couple minor differences.. but we eat it as a dip… have to use Frito Scoops!